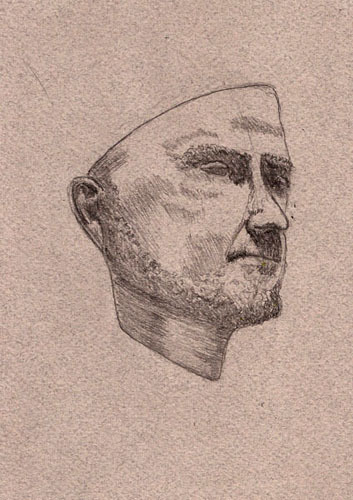 There’s a new exhibit at our Museum of Civilization that plays right into my new endeavor to learn how to use a pencil while drawing portraits. It’s called Mon Sosis a 2000 Ans which means, I think, My 2000-Year Old Double. While there’s some variation in how it’s presented, most of the displays look like this one (left). On the right is a head (or bust) from long ago and far away (many are Egyptian or Greek). 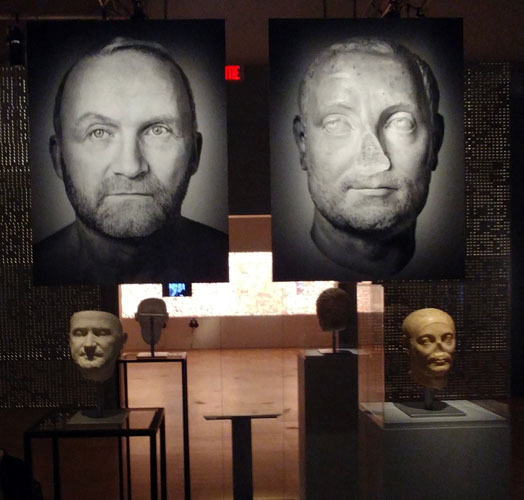 On the left is the result of scanning a person’s head and using the results to 3D print a mask of the person’s face. 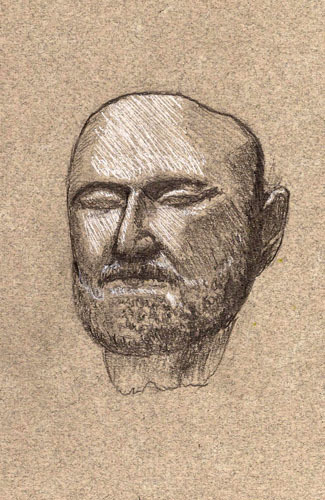 The pictures above show you what the person looks like with a comparative photo of the ancient sculpture. This presents to the sketcher an array of faces/sculptures to sketch. The downside of the 3D masks is that the person’s eyes are closed and the top of their head is gone so there is no hairline. Still, they don’t move which is a plus. Here are a couple of drawings from my first batch of sketches. I’m not very good at this but I’m determined to improve. Your portraits are very good ! Mozart : you’ll have to re-try ! And be brave, Larry ! Perhaps next year uou will be better !